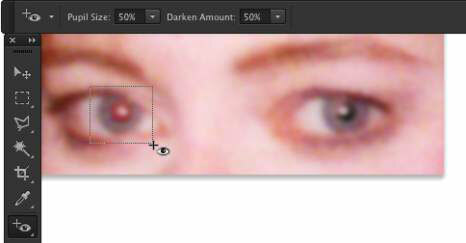 When editing photos and portraits in Photoshop CC, you might sometimes want to correct red-eye. When a subject looks directly into the camera and the camera-mounted flash fires, the result is often red-eye. This result is caused when light (such as a flash) bounces off the blood vessels at the back of an eye, and it gives the subject a spooky vampire look. Among the many ways to minimize this problem is with the Red Eye tool, nested in the Toolbox with the healing and patch tools. Zoom in and drag a small rectangle over the iris and pupil to watch the red disappear, leaving the natural highlights and a perfect eye. As you see in this figure, the default settings are good for typical cases of red-eye. To the left, the Red Eye tool being dragged; to the right, the result. The Red Eye tool finds red and not green. For green-eye (in photos of animals), for too-bright white reflections from eyes, and for those times when you’re not happy with the performance of the Red Eye tool, use the Brush tool (as you see in this figure). 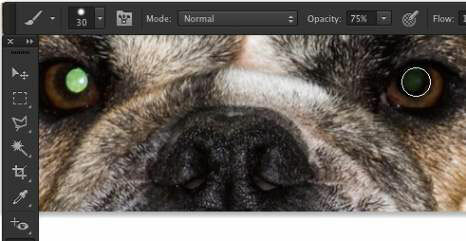 Set the foreground color to black; in the Options bar, select the Normal blending mode and an Opacity of about 75%. Use a brush diameter just slightly larger than the pupil and a brush hardness of about 85%. Click once and evaluate the result; if necessary, reduce the Opacity to 20% and click again. Here’s one more red-eye/green-eye trick: Use the Sponge tool to desaturate, followed by the Burn tool (Midtones, 25% exposure). You’ll find the Sponge tool nested in the Toolbox with the Dodge and Burn tools.